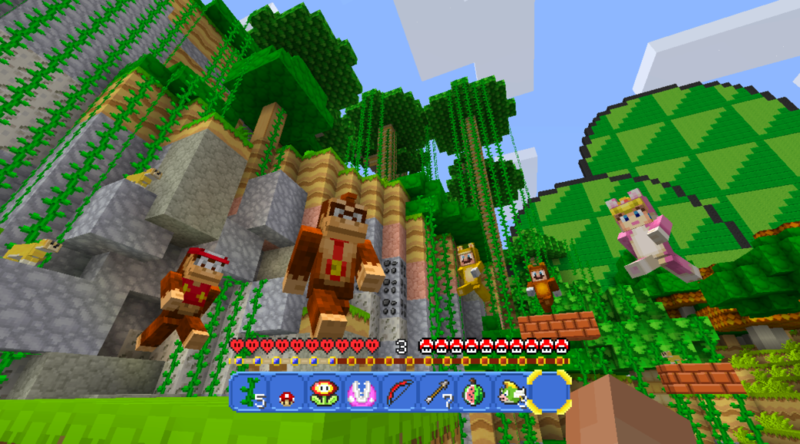 Minecraft for Wii U has received an update bringing it a whole slew of new Uodate Aquatic features that already exist on the Bedrock Edition. Wii U players can go get the free update now from the Nintendo eShop. Added the Update Aquatic! The oceans of Minecraft are now teeming with new life! Added Shipwrecks, Underwater Ruins, Coral Reefs, Icebergs, Underwater Caves/Ravines, and Buried Treasure to world generation. Added new blocks: Coral, Dried Kelp, Sea Pickles, Sea Turtle Eggs, Stripped Logs, Blue Ice, Prismarine Stairs, and Prismarine Slabs. Added Bubble Columns that are created by underwater Magma or Soul Sand. Bubble Columns push players and mobs to the surface, or drag them under! Added Tridents, and their unique enchantments; Impaling, Channeling, Riptide, and Loyalty. Added new Potions and Arrows of the Turtle Master, and of Slow Falling. Added Buried Treasure Explorer Maps that will lead you to great wealth hidden under the sands! Added Cod, Salmon, Pufferfish, and 2700 types of Tropical Fish! Added the Dolphin, a friendly mob that helps players out! Added the Phantom, a mob that hunts down tired players. Added the Sea Turtle, a mob that travels the world but always returns home. Added the Drowned, a monster that attacks players that enter their underwater domain. …And a new Tutorial world to show you how to use it!